One emergent theme throughout the curriculum is environmental sustainability. Several classes are explicitly devoted to the study of environmental issues, but nearly every class – particularly in science – touches on it in one way or another. 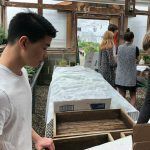 Outside of science, statistics and other mathematics classes evaluate electrical production and usage on campus to determine what can be done to improve sustainability. This information is obtained through the use of technology designed to promote efficiency, and is tabulated in the campus energy dashboard to allow easy tracking of electrical usage. Deerfield Academy has adopted a forward-looking sustainability mission statement and has created a Sustainability Action Plan to help us bring our community together on this important issue.